When I was in the seventh grade at Livingston Elementary, I remember well how Jimmy Long would sometimes bring his record player to school, along the most poplar records that were being played during that year, and at lunchtime, he played them for us. Some of the girls in our class would dance, while the boys who wanted to hear the music sat around in the room and listened. More than likely, the records that Jimmy played probably came from Bush’s Radio Shop down on Church Street in Livingston. That was the only place they could be bought around here at that time. And anyone who ever went in to buy a record from Annie and Bush will remember how Annie would put the record on and dance to the music while the customer decided if that was the one he or she wanted to buy. Rock and roll music and Annie Taylor were made for each other. Annie was the daughter of Burr Ledbetter and Lou (Lewis) Ledbetter. She was the third child in a family of eight children whose names were Myrtie, Lester, Lloyd, Carl, Mabel, Robert, and John K. Polk. Their Grandpa Polk Ledbetter helped to deliver all eight of the children. He was a self-made nurse. He also operated on mules, cows, horses and dogs. Annie remembers a Sunday dress her mother made her when she was 3 years old. She described it as being dark pink with a gathered skirt, square neck, short sleeves, and a sash at the waist that tied in a bow. She wore it with black patten shoes. Her school dresses were called aprons that had two pockets on the front. The material cost 10 cents a yard, and a child’s dress could be made from a yard of material. Eggs could be bought in 1917 for 12 cents a dozen, and one egg would buy a penny pencil, and five eggs would pay for a tablet. She describes the school house she went to as having long benches to sit on with as many as five kids to a bench. Her lap was her desk. The children wore coats all day in the winter, and their shoes were high top, some laced, and others with buttons that were fastened with a button hook. Pencils were sharpened with a knife. At Christmas, the Ledbetter children hung their stockings on the nails that their mother and dad drove in the edge of the fireboard or mantle. Sometimes they would get an orange and a piece of peppermint candy. If their parents could afford it, they bought a large stick of candy, and by using a hammer, broke it in to little pieces to be divided up among the children. Most of the time, their mother would make molasses candy and that was their Christmas. In the spring, their father would take a hundred or two chickens, put them in coops, load them on a wagon, and bring them to Livingston to sell. Maybe he would get $30.00 for than many chickens, and the money was used to buy things for the children. New shoes, shirts, pants and material to make dresses would be bought with the money. Annie met Cosby Benton Taylor, better known as Bush, when she started to high school at Alpine in 1929. Bush’s home was in the Taylors Crossroads Community. Annie stayed at the home of some cousins during the week while she went to school in Alpine, and every Friday evening, her father would come to walk with her back to their home which was about two miles up on Alpine Mountain. She describes their home place as being where boys go to ride their four-wheelers now. One Friday as she and her father were walking home, he asked her how she was doing in school. She took that opportunity to tell him that she and Bush had decided to get married. Her father wasn’t too happy about this, and told her Bush was too old for her. Her reply was, "Dad, you’re 13 years older than Mamma." She said he grinned and didn’t say no more. When Annie and Bush married on December 7, 1930, they didn’t have anything but a T Model Ford. Bush was working as a mechanic for Carl Copeland when they married. He later developed an interest in electronics, and in 1934, got his ham radio license. Since Bush had only a third grade education, it was Annie who taught him to read and write. Together they bought the books necessary so that Annie could teach him properly. They went into radio repair business around 1931. Addison Bilbrey was their very first customer. 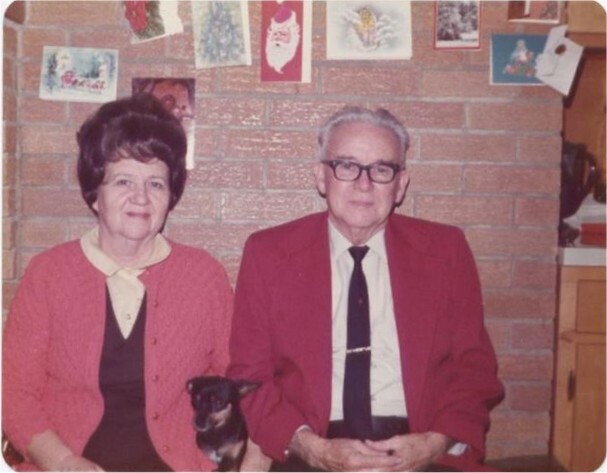 When World War II began, and business declined, Annie and Bush closed their shop and moved to Akron, Ohio where they both found work in an aircraft plant. Bush did the wiring on B-47 airplanes. Annie’s job was consisted of working on the trailing edge of the wings on Cosier navy aircraft planes. She helped to build 10,000 planes while employed there. They returned to Livingston and reopened the business that continued in operation through the 60's. Annie and Bush worked side by side for 30 years. Annie said they never went to sleep mad at each other. Bush repaired radios and many times, would charge very little for his work. Sometimes he and Annie were called on for help that didn’t involve repairing or selling radios. They would often get calls from someone who needed to get to a doctor, and they would go get the person, and then take them back home. Annie described Bush as being someone who was very good to her family members as well as his own. He died November 2, 1983. Annie’s home is filled with pictures and mementoes of a long and happy life that she and Bush shared. The recorded memories she has in her notebooks describe a life that no longer exists, but I’m so glad she took the time to write all this down so that you and I can see the world the way it was through the eyes of this lively little lady I remember so well behind the counter of their shop. Thank you, Annie, for all the good memories.